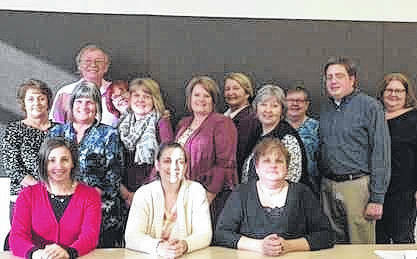 CHILLCOTHE — The Ohio Department of Aging and the Area Agency on Aging District 7, Inc. (AAA7) recently sponsored a class leader training program for the evidence-based program, Powerful Tools for Caregivers (PTC). The two-day training was conducted at the PACCAR Medical Education Center on the campus of Adena Medical Center in Chillicothe. Participants in the training included representatives from the Ohio Department of Aging, Corporation for Appalachian Development in Southeast Ohio, Catholic Charities of Southwestern Ohio, the Cincinnati VA Medical Center Community Based Outpatient Clinic in Brown County, Ohio, as well as staff and community volunteers from the AAA7. Certified PTC Master Trainers from the AAA7 conducted the class leader training to fully prepare the 12 leaders to teach Powerful Tools for Caregivers to family caregivers across various counties in Ohio. Powerful Tools for Caregivers has served caregivers of adults with chronic conditions since 1998. After successful pilot classes, PTC expanded the population of caregivers served to include caregivers of children with special health and behavioral needs (including minors and adult care receivers with special needs). Classes are designed for groups of up to 15 and provide caregivers with a variety of tools and information to help in their caregiving role. Caregivers benefit from the PTC six-week series of classes whether they are:Spouses/partners of an adult with a chronic condition; Adult children of aging parents; Parents of children with special health and behavioral needs; Grandparents raising grandchildren with special needs; Long-distance caregivers; In differing stages in their caregiving role; From diverse rural, urban, or ethnic communities; English, Spanish, and/or Korean speaking. To obtain more information about the program, please visit the website at powerfultoolsforcaregivers.org. The AAA7 will be offering the six-week class series in 2018 in various locations throughout the district. Please call the AAA7 at 1-800-582-7277, ext. 22284 for more information. You may also visit www.aaa7.org for a Community Wellness Calendar that lists the class schedule for 2018. Your local Area Agency on Aging District 7, Inc. provides services on a non-discriminatory basis in ten counties in Southern Ohio including Adams, Brown, Gallia, Highland, Jackson, Lawrence, Pike, Ross, Scioto and Vinton. These services are available to help older adults and those with disabilities live safely and independently in their own homes through services paid for by Medicare, Medicaid, other federal and state resources, as well as private pay. The AAA7’s Resource Center is also available to anyone in the community looking for information or assistance with long-term care options. Available Monday through Friday from 8:00 am until 4:30 pm, the Resource Center is a valuable contact for learning more about options and what programs and services are available for assistance. Those interested in learning more can call toll-free at 1-800-582-7277 (TTY: 711). Here, individuals can speak directly with a specially-trained Agency staff member who will assist them with information surrounding the programs and services that are available to best serve their needs. The Agency also offers an in-home assessment at no cost for those who are interested in learning more. Information is also available on www.aaa7.org, or the Agency can be contacted through e-mail at info@aaa7.org. The Agency also has a Facebook page located at www.facebook.com/AreaAgencyOnAgingDistrict7.